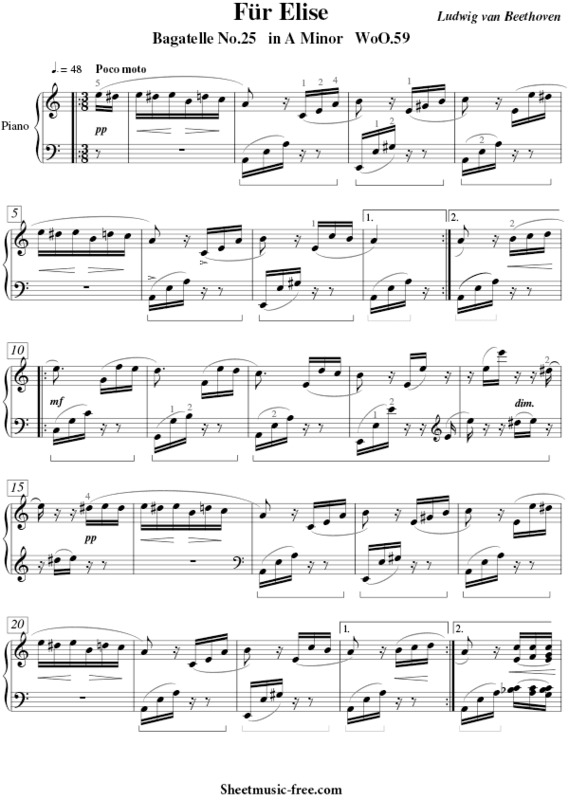 “Fur Elise Sheet Music” by Beethoven, “ Fur Elise Sheet Music” for Piano, Original key: A Minor, number of pages sheet music PDF: 4, Video Piano Cover song Fur Elise Sheet Music. “Fur Elise’” Bagatelle No. 25 in A minor (WoO 59, Bia 515, and ?A123456) for solo piano, commonly known as “Für Elise” or “Fuer Elise” , English: “For Elise”, sometimes written without the German umlaut mark as “Fur Elise”), is one of Ludwig van Beethoven’s most popular compositions. It is usually classified as a bagatelle, but it is also sometimes referred to as an Albumblatt. Fur Elise Sheet Music Beethoven. he piece is in A minor and is set in 3/8 time. It begins with an A minor theme marked Poco moto (little movement), with the left hand playing arpeggios alternating between A minor and E major. It then moves into a brief section based around C major and G major, before returning to the original theme. It then enters a lighter section in the submediant major of F major. It consists of a similar texture to the A section, where the right hand plays a melody over left hand arpeggios. It then enters a 32nd note C major figure before returning to the A section. The piece then moves to an agitated theme in the subdominant key of D minor with an A pedal point, as the right hand plays diminished chords. This section then concludes with an ascending A minor arpeggio before beginning a chromatic descent over two octaves, and then returning to the A section. The piece ends in its starting key of A minor with an authentic cadence. Despite being called a bagatelle, the piece is in rondo form. The structure is A–B–A–C–A. The first theme is not technically difficult and is often taught alone as it provides a good basic exercise for piano pedalling technique. However, much greater technique is required for the B section as well as the rapid rising A minor figure in the C section.